Arrival and check in at the hotel and rest of the day is free for independent activities. A beautiful complex of Palaces, halls, pavilions, garden and temples built by Raja Mansingh, Mirza Raja Jaisingh and Sawai Jaisingh over a period of about two centuries, still standing in magnificent state. The palace complex emerge dramatically from the Placid waters of the Maotha Lake and is approachable only through a steep path. Tourists often ride on the elephant back. Amer Fort- the red sandstone and white Marble palace has some very interesting apartments- Diwan-I-Aam, Ganesh Pol, Sheesh Mahal, Sukh Niwas, Jai Mandir, Man Singh Palace and Shila Devi Temple. Later you will visit the Pink City-visiting Jantar Mantar-the 0bservatory built in 1700 It look futuristic and almost surrealistic even today. A tour of the city palace & museum Which offer a rare combination of the finest blends of Rajasthani and Mughal Architectures, a dedicated collection of Royal costumes, armoury, guns, old paintings Dresses, articles used at royal households etc. 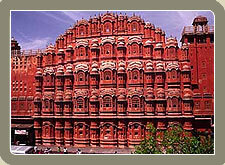 A visit to Hawa Mahal or the Palace of Winds. An unmistakable landmark of Jaipur, which conjures up several romantic Images in the mind of the on looker. Back to hotel and overnight. After breakfast you will drive to Pushkar (140 kms/ 2 ½ hrs). Arrival and check in Hotel. Later visit of Brahma( the creator of the world) Temple, which is the only one in the World. After temple you will visit the Bathing Ghats of holy lake of Pushkar. After breakfast drive to Jodhpur (235 kms/4 hrs). Arrival and check in at the hotel. In afternoon you will visit the Mandore Gardens, where you will see the large size Statues of local heroes and beautiful garden. Back to hotel and overnight. After breakfast sigh seeing tour of the erstwhile Marwar capital. 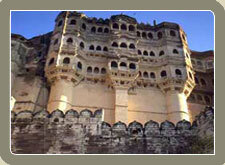 From the imposing Mehrangarh Fort to the delicately wrought jharokhas of the havelis, the citadel has some of the finest examples of Rajput masonry. At the foot of the fort lies the Jaswant Thada, a richly carved white marble cenotaph. In the afternoon take Jeep safari to the picturesque Bishnoi villages to experience rustic Rajasthani life. The drive through the countryside abounds with black bucks and Chinkaras grazing serenely, and migratory birds dot the skies. Back to hotel and overnight. After breakfast drive to Udaipur (335 kms/06 hrs) enroute visit Ranakpur, one of the five holy places of Jain community, the most important temple is dedicated to Rishabh Dev ji and sprawls to some 48,000 sq.ft. and has 29 halls and 1444 pillars, all distinctively carved. 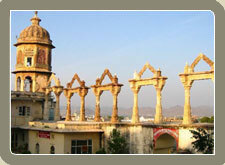 Arrive Udaipur late in the afternoon, check in to your hotel and overnight. After breakfast drive back to Jaipur. Arrival and end the tour.